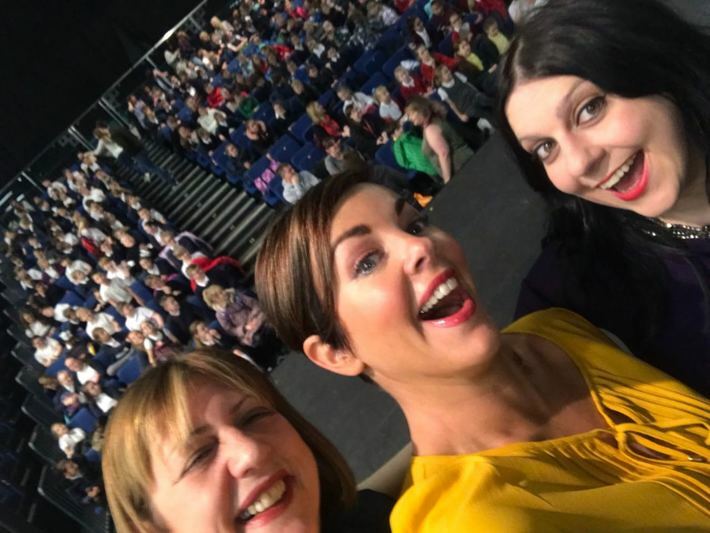 Another year, another magical celebration of children’s books at the Doncaster Dome, in a day absolutely jam-packed with excitement and fun. 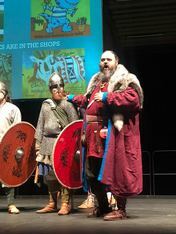 Our special guests this year were authors Janina Ramirez and David Solomons, popular illustrator Liz Million and, a first for the DBA, Jofor’s Hall Viking re-enactment group, appearing in full costume complete with weapons! 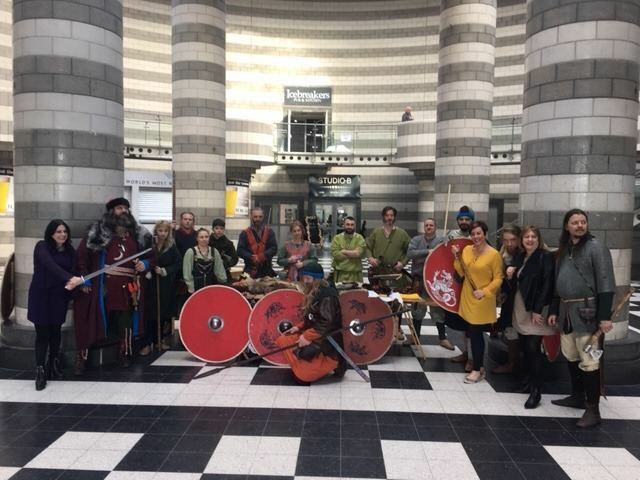 As the children arrived in the foyer to be greeted by these fearsome warriors,all shouting and banging their shields, the scene was set for a really exciting event. Phil got the day started, greeting the audience and guests and then introducing the fabulous and very funny Liz Million on to the stage. Getting into the spirit of the day, Liz arrived in a horned helmet (which, as we later learned, was definitely not authentic!) and two long blond braids which had a life of their own! 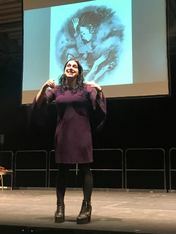 Her patter as she spoke about her career and artistic techniques while at the same time drawing live a very scary (and hairy!) Viking had the audience laughing out loud. Then, shouting and brandishing their weapons, Jofor and his warrior band marched into the hall and on to the stage and introduced themselves individually to the delighted and very loud audience. The warriors declared how they loved to raid other lands, fighting and carrying off slaves and plunder. Forming a shield wall, they advanced towards the cheering crowd, threatening all sorts of grisly murder, all while the children egged them on, shouting that they wanted to be captured as slaves! 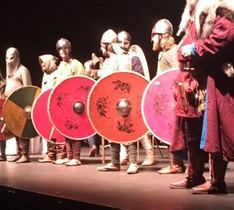 This bravado was slightly tested in some cases when the Vikings split up to go marauding down into the audience but by this time excitement in the hall was absolutely at fever pitch! It was then time for author, academic and TV historian Dr Janina Ramirez to take centre stage. Janina’s book The Riddle of the Runes had been shortlisted for this year’s award and is extremely popular with our young readers. Using one of the warrior’s spears (which was taller than she was!) as a very unique pointer, her fabulous presentation celebrated the wonder of Viking life while, as she said, busting some of the popular myths and stereotypes.The first of these was the horned helmets. They would, as she demonstrated, have been extremely impractical on a battlefield and even more so when crammed together on a Viking longship! 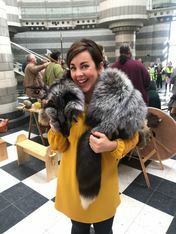 In fact, as we learnt, they only became associated with Vikings when they were used in a Wagnerian opera to make the singer easier to see on stage! Throughout her talk, Janina used evidence from archaeological digs to show her enthralled audience the complexity of the Viking world. Interacting with the children throughout via two-way questions and comments, she showed how the amazing artefacts they left behind, particularly in their burial sites, prove that they were indeed, including some of the women,trulyfearsome warriors. However, they were also traders and explorers with a rich and complex societyand links right across the world, from their homelands in Scandinavia to the UK, mainland Europe, Russia, India, China, even discovering America long before Christopher Colombus got there! Using pictures of these, including an amazing helmet and a bone casket, she explained the complex systems of symbols and runes, and spoke about the gods and goddesses who so influenced Viking life. Janina then explained how she wanted her books to reflect the whole of Viking life so that she gave her main character, Alva, a family and described her homeland, her village, the animals they kept, the food and so on. In Alva, Janina created a strong and feisty female character with the strength of a shield maiden, but who is also clever and curious, wanting to explore and to solve mysteries. As she spoke, her own love of books and reading from childhood onwards was very evident, she even admitted to owning over 7000 books! Her audience were enthralled and the Q and A showed how fascinated they were by the stories and the Viking period, as did the signing queues as her talk finished. After lunch, both Liz and the Vikings returned to the stage, Liz to demonstrate more clever drawing techniques all based on a baked bean (yes, really! ), and the Vikings to act out some bloodthirsty battles and hideous torture techniques, such as the terrifying blood eagle, much to the inexplicable delight of the listening children. Our Viking Chieftan then presented our ‘Design a Shield’ competition winner, Ada from Our Lady of Mt. Carmel Primary with her prize, a full-size shield in her own design. Then it was time for our second author, David Solomons, to take the spotlight. David’s books are extremely popular in Doncaster, with My Brother is a Superhero and My Gym Teacher is an Alien Overlord on our lists over the past two years. He began his talk with some audience participation via a Superhero quiz, which showed the audience to be very well versed on this subject! He then showed us some of the worst superheroes he had come across in the extensive research he undertook before starting his series, including, unbelievably, ‘Arm fall off Boy’ who had the best comic sound effect ever in ‘PLORP!’ In his books, David almost subverts the genre, by using as his hero a boy called Luke Parker, who despite his love of comics and superheroes, misses his chance to be the ‘chosen one’ due to an ill-timed wee, so that instead his brother becomes ‘Starlad’. Despite great powers, Starlad and Luke have to travel by bus and be home for tea, creating great comedy potential! 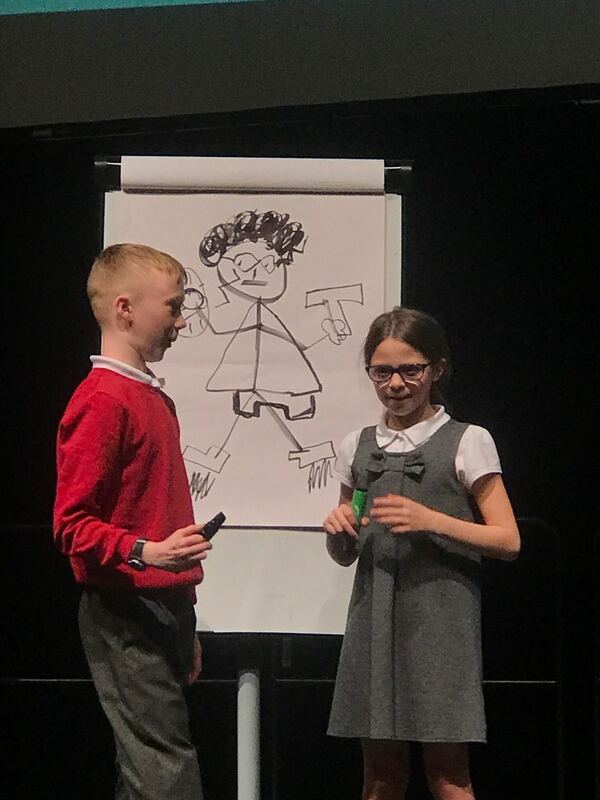 David then got the audience to create their own superhero, by inviting two young audience members up on stage and asking them to draw live a character invented by the rest of the audience. This was a fantastic way to explore the genre and its appeal, looking at all aspects of what makes a good superhero story. David interspersed the discussion with loads of fascinating nuggets of how popular superhero conventions, such as the costumes, cape, even super-villains came into existence. With great silliness and many supremely daft suggestions, the audience had to come up with special powers, appropriate superhero clothing and accessories and finally a name.The winning name, which proved wildly popular, was Captain Fartnugget!! Enough said! By this point it was almost time for the winner announcements. 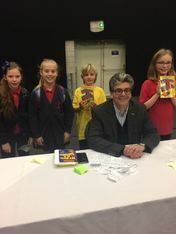 Paul from Waterstones, who were once more supporting our event, announced the winners of the Best Review competition: Sophie from Year 8 in Armthorpe Academy won the Secondary prize and Toby from Saltersgate Juniors was the Primary winner. Saltersgate were then also awarded a set of the Primary and Classics list titles as the primary school which had submitted the most reviews, with Hall Cross Academy taking the Secondary list prize. Then Phil made the announcement that everyone was waiting for, the results of our readers’ votes. The Primary winner for this year was The Wizards of Once by Cressida Cowell, The House with Chicken Legs by Sophie Anderson won the Secondary category, and our Classics winner was M G Leonard’s The Beetle Collector’s Handbook . 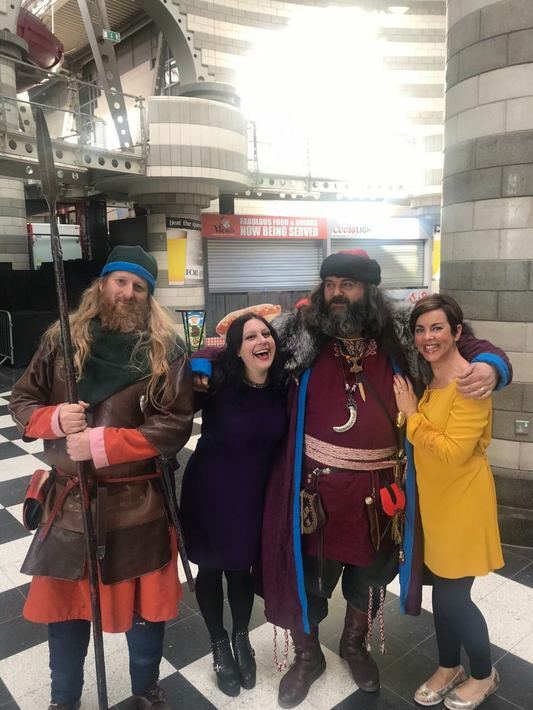 Judging from the responses our audience were definitely happy at the outcome, and it only remained for Phil to close the proceedings and give everyone the chance to meet David and have their books signed or have more photos with our Vikings. This was one of our most fun events ever, and, on behalf of the DBA committee, I’d like to thank all those people who helped us throughout the year in so many ways, our wonderful guests, Waterstones, especially Paul, The Arts Council, The Terry Bramald Foundation, DFS, The Dome Staff, ASDA, Hopkins Book Service and not least our fabulous volunteers from DWP and elsewhere. I’d also like to thank the staff and parents who worked so hard to promote the books and encourage the children to read and enjoy them. Finally, thanks to all the children who read, reviewed, voted and took part in our competitions, events and activities. You are all amazing and we couldn’t do it without you!